In the 1960s and 70s, a controversial new movement swept through the New Zealand church, bringing with it a fresh wave of passion and vigour that changed people forever. That revolution became known as the Charismatic Movement. Bev Montgomery has brought together a collection of personal accounts of New Zealanders who were transformed by the Holy Spirit and who took hold of a calling to serve God with sincerity and selfless dedication. They were unwilling to be deterred from following what they believed God wanted them to do. Featuring the stories of: David Cowie, Barry Austin, John Coyle, June Dooney, Brian Caughley, Dianne Milmine, Ian Garratt, Graham Braddock, Marjorie Claret, Janet Tillman, Eric Balderston, Margaret Thompson, Gerald and Gayel Paterson, Sue Pollard, Nick and Jean Oakden, Di Willis, Lyn Stanley, and Bev Montgomery. Foreword by Bruce Thompson. 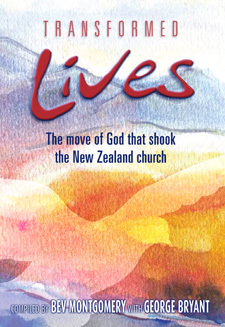 "Bev Montgomery has provided a gift to the Christian community by assembling these firsthand accounts... this book provides a memorable and informative read about a significant turning point in the life of the church in New Zealand and further afield." "This book is full of encouragement for my generation because, as individuals, our limited perspective always causes us to underestimate the works of Jesus in our day. Reading these stories will allow a new generation of young believers to align themselves with what the Holy Spirit can do." Bev Montgomery is a trained teacher and nurse who personally experienced the Charismatic Movement, including ventures overseas with YWAM. Most of her life has been spent in some part of nursing education. She holds a nursing degree and a Bachelor of Divinity degree.